I spend most of March prepping and planning for a busy month of birthdays, and this month has been no exception as it has as ever flown right to the end in a flash; yesterday I turned 21 and I had a wonderful day filled with copious amounts of food (all of which you’ll have seen on my Instagram and Twitter) and I will giving you a little peek into my birthday bakes later this week, but firstly, let’s rewind. March finally bought us some sunshine, the epic Anna and Lily 90’s Playlist on Spotify, and so many new finds and purchases that they’ve obviously clambered into my top March Favourites, so let’s chat the best of the best shall we…. Spring weather meant I was cracking out striped tops left, right and centre, however I soon discovered I actually only had two wearable tops in my wardrobe so a H&M haul was needed. I picked up three striped tees, a printed tunic and a blue floral top to make my wardrobe a bit more exciting, and I feel more fabulous, stripey and blue in my life than before! Yay for tops! Timely enough, my Winter body wash ran out at the start of March, so it was time to re-visit an old favourite – Rituals Hammam Delight, which has been re-packaged into a lovely blue container (be still my blue loving heart) and has the most incredible zingy scent of Eucalyptus and Rosemary that gets you ready to start the day with minimal fuss and a fresh mind. If you love a clean, invigorating smell, I urge you to try this. It appears I have been obsessed with eyes this month, and rightly so as these are all outstanding products. Firstly, I’ve gone a bit cray and outside my comfort zone by regularly rocking a red toned eye-shadow on my lids which you’ll have seen here, and I absolutely love the way it brings out my green eyes. MAC Star Violet has been my shadow of choice, and it’s mix of red, pink and gold tones make it so flattering to wear, and it’s paired perfectly with Laura Mercier Caviar Stick in Amethyst as a base. Amethyst is more of a red-purple-silver toned product, but it picks up the flecks of green nicely to give your eyes that standout position in your look. Total winner for any green-eye gal! Now to make those eyes look even more special, I have gone back to my fave mascara brand to give their new product a go, and I have been so impressed. Maybelline Lash Sensational Mascara does everything I hoped it would do; the curved wand is amazing for adding volume and length, and by using the outside of the curve my lashes feel plumped and separated for a gorgeous doll-eye look that I can totally get on board with. To take it all off is the one and only Emma Hardie Cleansing Balm, which I finally picked up after months of using a mediocre product. Whilst Elemis Pro-Collagen Cleansing Balm is still my #1, EH is quickly catching up with its gorgeous scent, thick and balmy texture, and quick nourishing cleansing. I’ve been using and drinking Moringa powder for a while so it’s fab to start using it in my skincare regieme too. A bit of an odd one in the mix, but something so delicious I can’t miss it off. As I said in my Gousto Delivery review, I had the most delicious Halloumi salad where the Halloumi was rubbed in Ras El Hanout, and I am so converted to this spice. If you like cinnamon, you will love this as it has that warming taste and smell to it, with a bit of a kick and also a freshness to it. It’s so unique, and now I can’t stop using it in everything – be prepared for more recipes including Ras El Hanout (not Rag al Ghul as I said by mistake). March has been so exciting, so fun, and a great end to my 20th year. I’ve got some really great things planned with Britton Loves over the next few months, and I can’t wait to keep sharing my thoughts, posts and favourites with you weekly. 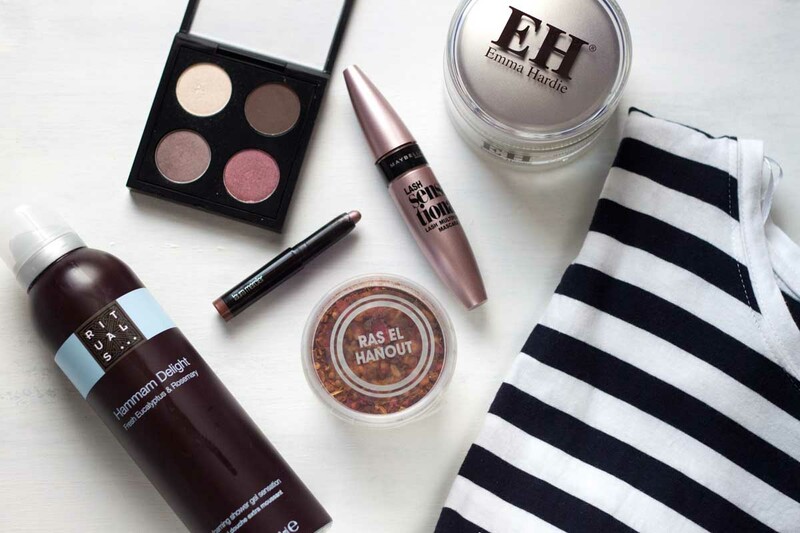 Time to end the March Favourites segment, and hit play on April…. What have been your March Favourites? Have you got a passion for stripes? Do you love spicy food?